If you’re a leader in a local church, you know that change does not always come easy. Let’s face it, often times it is downright hard to bring about change in the church. Time and time again, change initiatives fail and the leader is left wondering what went wrong. What if I told you there was simple formula you could follow that would help you determine whether or not the change will succeed? Believe it or not there is a formula that can increase your chance of success when implementing change. 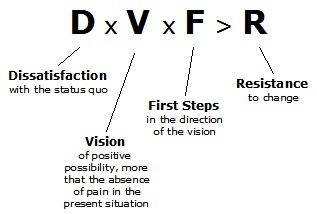 The formula for change created by Richard Beckhard & David Gleicher is: D x V x F > R.
These factors, when multiplied together, must be greater than the resistance to change (R). This means that if any the factors (D, V, or F) are low or absent then the change you initiate is doomed to failure because it will not be able to overcome the resistance. Change in the local church is hard because these factors apply to the pastors, staff, and congregation alike. It is not enough for the leader to be dissatisfied with the status quo, they have to cast a compelling vision and provide next steps so the rest of the staff and the congregation can get on board with the change. Be clear about why things need to change. To create a willingness for change, articulate why it is unacceptable to stay the same. If we, or our people, are not dissatisfied with our current reality, then there will be no motivation to change. Make sure you describe the future in a way that is very clear and easy for anyone in your church to envision. Ensure that your staff and key volunteers understand and can articulate the future of the church and their role in it. Over communicate the vision. Many pastors drop the ball here because they think that people grasp the vision the first time they hear it. Don’t stop talking about the preferred future! Keep the vision before your people. The clearer the vision, the more enthusiastic people will be to realize it. Make sure the vision is accessible to everyone. It is not enough to be dissatisfied with the current reality and have a picture of your preferred future, you must provide a clear strategy to achieve the vision. Provide clear next steps and measurable wins along the way. As your church sees that the change is working, their resistance to change will be lowered. A vision moves from a far-fetched dream to an achievable goal when you have a clear cut plan of action. Make sure everyone (staff, volunteers, congregation) understands what steps they need to take for the change to be successful. If you want to lead change within your local church: determine the need for change, paint a clear picture of a desired future, and determine what steps must be taken in order to move to the desired future. How can you put this formula to work in your church? 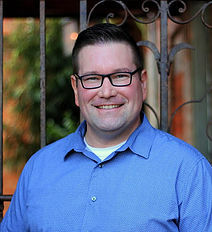 « Can churches grow insiders and reach outsiders?